A view from the sidewalk of the Palmetto Park Road Bridge. The county built the north side of the bridge, then they tore down the existing bridge, and then they built the south side of the bridge. 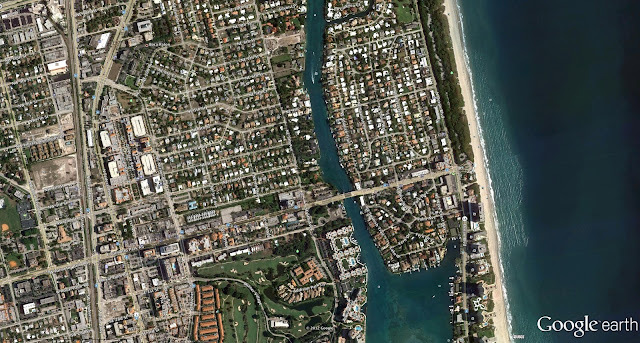 The $5.4 million project allows taller boats under the bridge, which means less backed-up traffic, and the four lanes means twice as many vehicles traveling to and from Boca Raton's beaches (see Google earth photo below). Palm Beach County, Florida Bridges: Palmetto Park Road Bridge across the Intracoastal Waterway (2) by Mark Yashinsky is licensed under a Creative Commons Attribution-NonCommercial-ShareAlike 3.0 United States License.